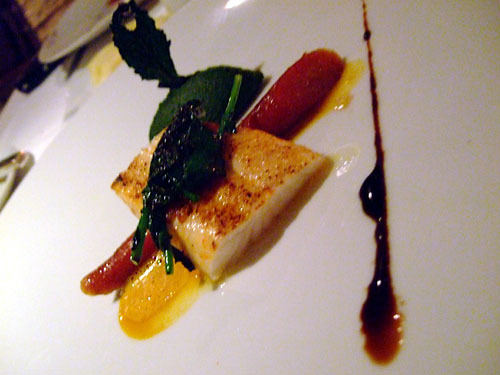 Providence's executive chef Michael Cimarusti hails from the famed Water Grill restaurant in Downtown LA. I enjoyed Water Grill so I was looking forward to experiencing what he could do given his own restaurant. Providence occupies the space left vacant by Patina, which incidentally moved Downtown. 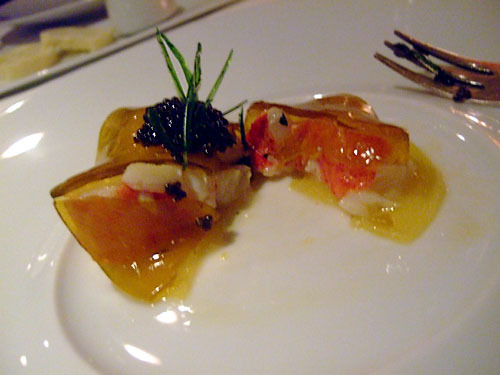 The space has remained pretty much the same, though the menu now is tightly focused on seafood (not a bad thing!). The restaurant is small, with two main dining rooms and a bar area. The space is dimly lit and chicly decorated, with fashionably dressed servers gliding effortlessly back and forth between tables. 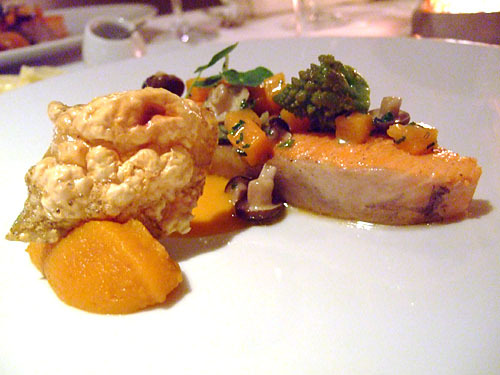 We went for the 9-course Market Menu, with included wine pairings. Note the signatures of Cimarusti and pastry chef Adrian Vasquez (replete with chocolate thumb print). 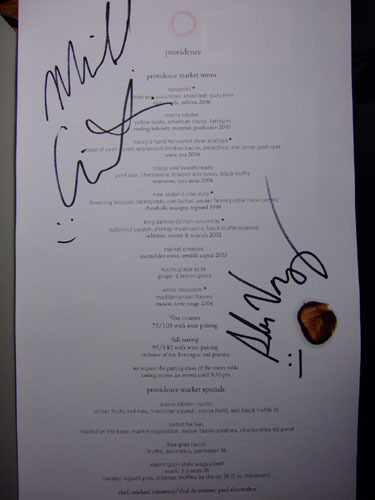 There is also a Chef's Menu that will run about $150pp; we'll definitely try that on our next visit. Click for a larger version of the menu. 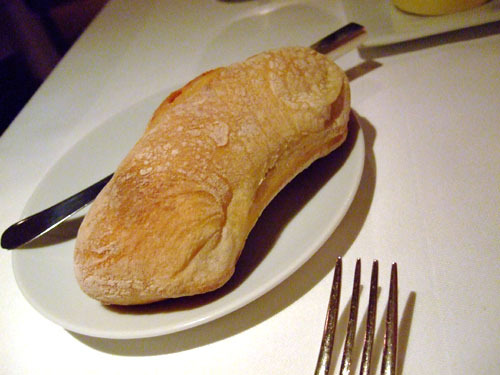 I was a bit let down that there was only one type of bread offered, though the butter and salt (first time I've seen such a thing!) were very good. 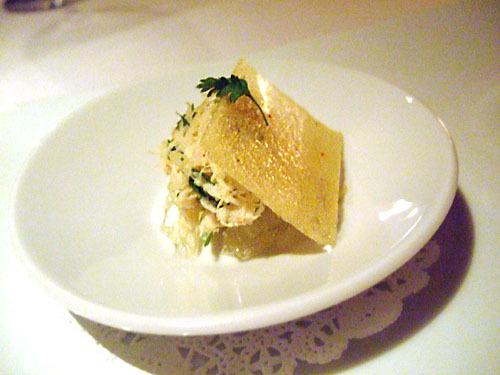 We started with dungeness crab with lemon jelly and parsnip flake, along with a carrot soup with curry foam. 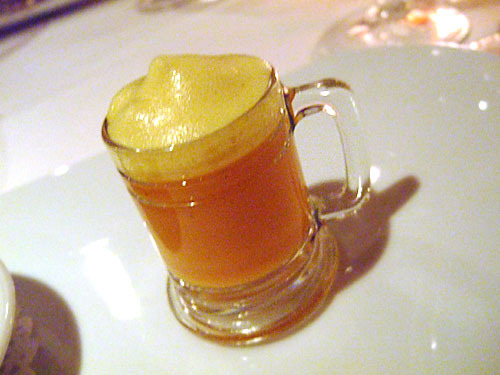 The crab was a tasty little morsel, but the soup was more interesting, with a nice contrast between the texture, temperature, and flavor of the soup and the foam (the foam actually was very reminiscent of an Indian curry). 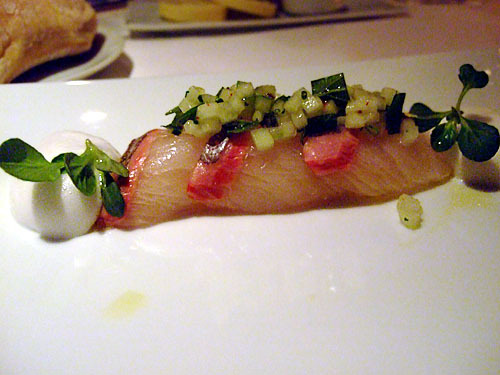 Kanpachi is amberjack, and this was a nice cut of it. However, I felt that the fish could've gone with fewer accoutrements. 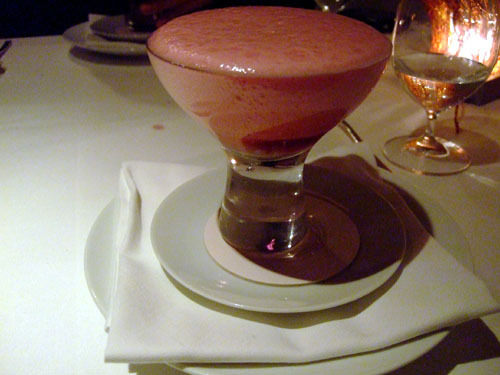 For example I would've liked it to be a bit less tart (possibly due to the yuzu). I quite liked the paired Vihno Verde, which had slightly mineraly tang with a nice effervescent feel; refreshing. 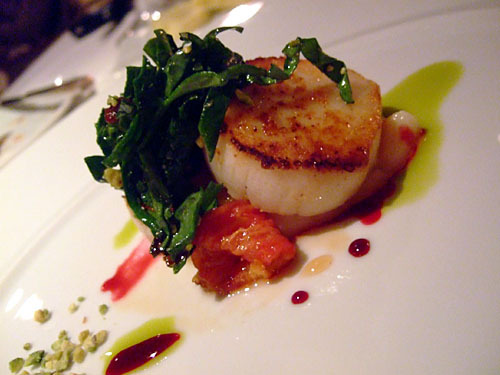 I had heard good things about Nancy's scallops and boy they did not disappoint. I know bacon is an obvious foil to scallop, but everything really came together well here. One of my favorites of the night. I don't know who Nancy is, but my hat's off to her! 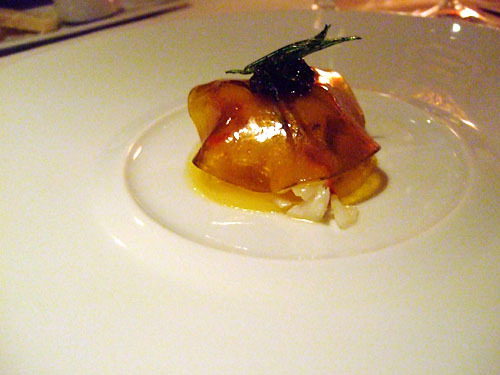 I believe this was my first time having John Dory, and I found the fish to lack any distinctive qualities. It was tasty but I don't know if I could tell it apart from other fish in a blind tasting (unlike with salmon, halibut, turbot, sea bass, etc.). 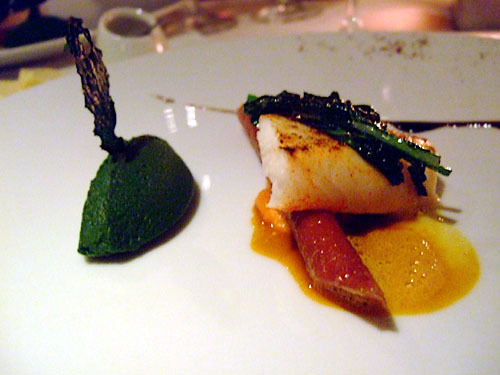 I believe the oblong green object was a purée of broccolini, I wasn't a huge fan of its taste, along with the carrot. One of the standout dishes for me. 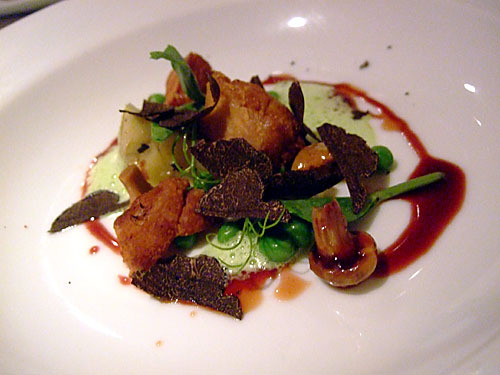 Sweetbread is either pancreas or thymus gland; that may not sound appetizing but I've enjoyed sweetbreads on every occasion I've had them. 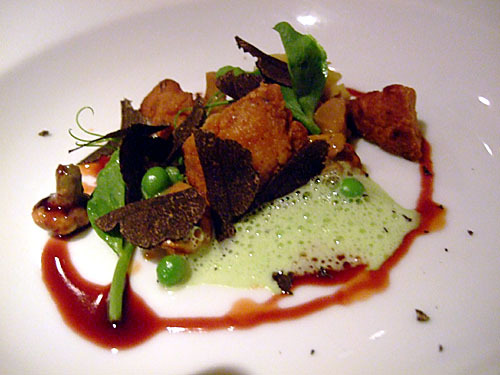 I not only loved the sweetbreads themselves, but also the chanterelles, the truffles, and everything in between. Good wine pairing too. 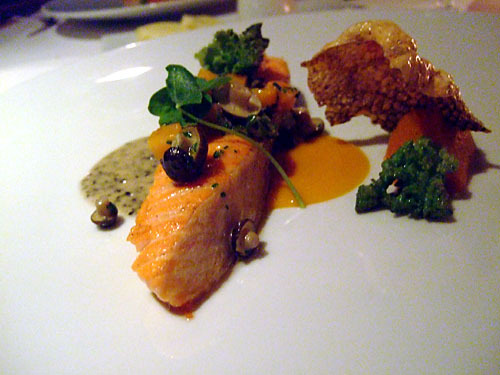 The quintessential expression of salmon. 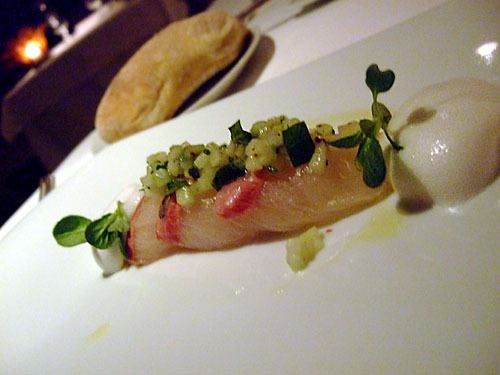 I liked the flavor of the fish though texture-wise I would've preferred something firmer. The "chip" in the squash was actually made of salmon skin and quite delicious. From right to left (the order in which we were advised to eat the cheeses), we have a Grenache sheep's milk cheese from Spain, a goat's milk cheese from England, and truffle cow's milk cheese from France. 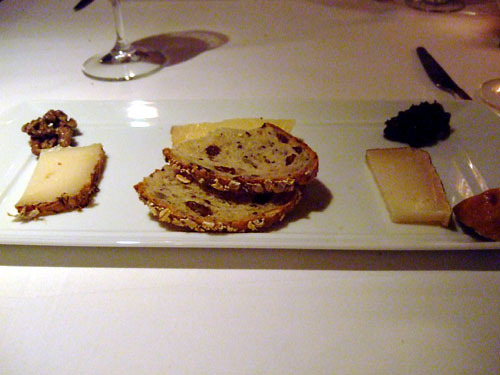 The cheese was served with olive marmalade, candied walnuts, fig, and cinnamon toast. 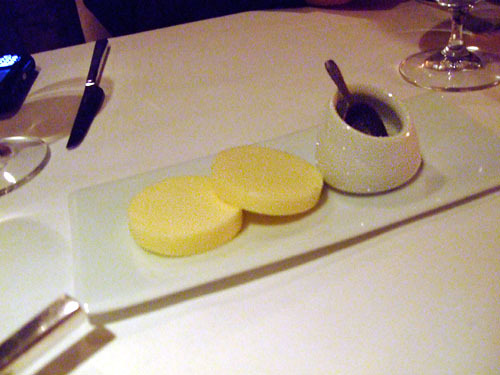 When the glasses were first brought to the table, they had a dollop of ice cream in the middle. Our server then proceeded to fill the glasses with a delicious grape soda from a pressurized canister. Très cool! 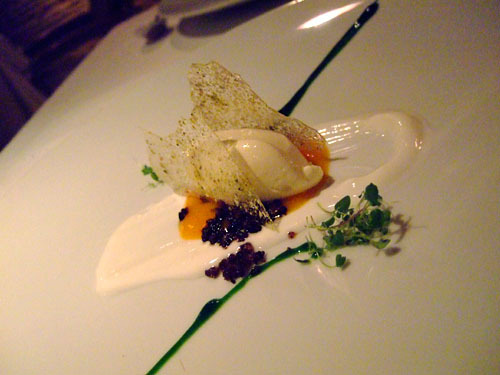 The "mediterranean flavors" included olives, yogurt, saffron sauce, mint syrup, and white chocolate crisps. I quite liked the chocolate and the tanginess of the yogurt, though I felt some of the other flavors were definitely above me. Also I rather enjoyed the accompanying Muscat. 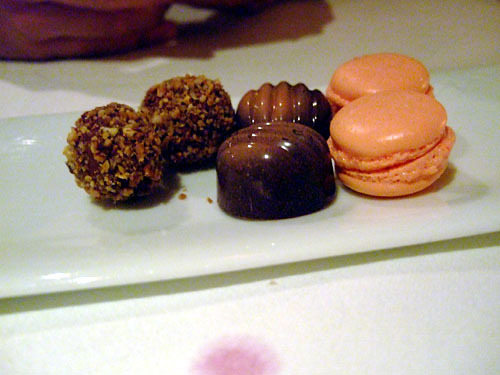 Going from right to left, we have raspberry macaroons, truffles, and marzipan praline balls; my favorite was the marzipan. A nice way to end the meal! My dining companion decided to order coffee, which I'm told was very good. 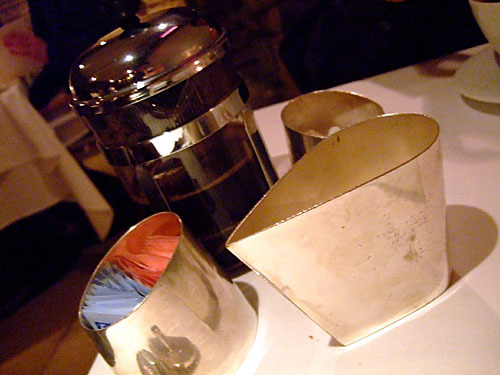 I love the container for the cream though (and I believe they were actually for sale at the restaurant). 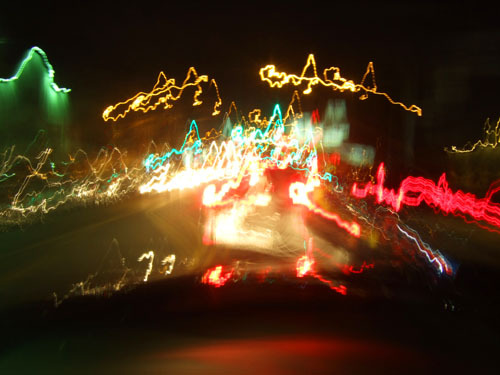 do you do that last shot b/c you're actually tipsy or because it's fun?